I just hope the Maggie Q positioning isn’t deliberate. 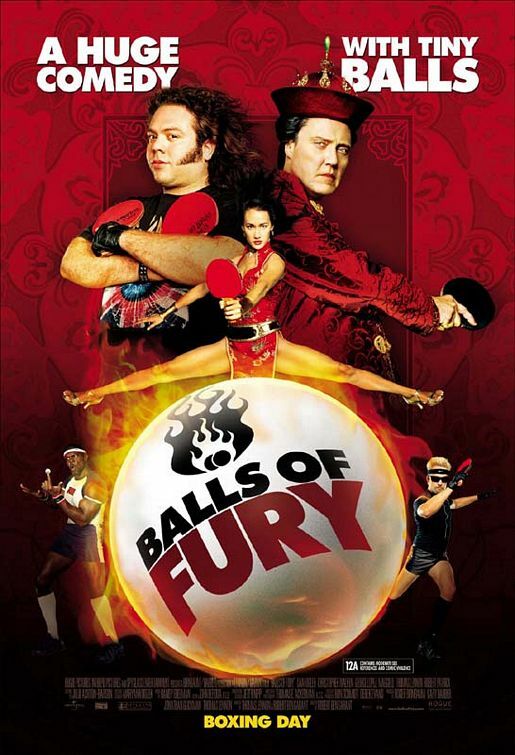 Balls of Fury is everything that you expect when you see the cover above. And it is a great idea… for a 6 minute skit. 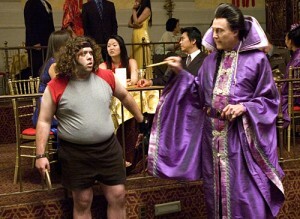 Randy Datona (Dan Fogler) is a fat, hirsute loser in his late 20s, obsessed with hair-metal bands. When he was a mere 12 year old boy Daytona was a prodigy, perhaps the greatest ping-pong player the world would ever see. That was before a shock loss and a poorly timed, globally televised quote harpooned his career and saw his father killed. This lead to nearly two decades of self-imposed anonymity working as a ping-pong cabaret act in scuzzy venues entertaining low spenders whose primary focus was the buffet. Then the FBI came calling (George Lopez) with an opportunity to redeem himself and avenge his father at the same time, all by using his ping pong skills to gain access to a Bloodsport style winner take all underground ping-pong tournament hosted by a mysterious triad crimelord named Feng. OK that’s enough. Eyes back here. That’s where the Bloodsport comparisons end. Balls of Fury finds Daytona entering the ‘seedy underbelly of ping-pong’, sees him being trained by a Mr Miyagi clone played by James Hong, and has him meet several outlandish characters along the way in a hail of nutshots, pratfalls and silly jokes. 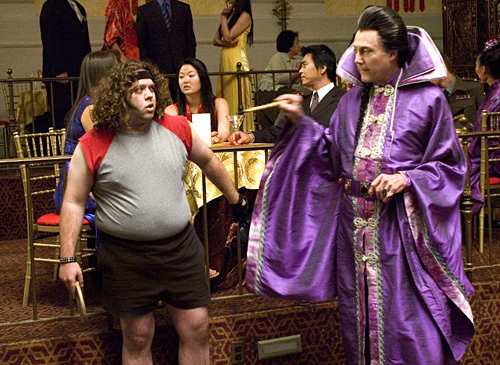 Walken is actually not one of the funny parts of Balls of Fury, aside from that is that he plays a Chinese guy with a Brooklyn accent who dressed like Dracula in drag, he actually only gets a few jokes thrown his way. The actual amusement value is primarily derived by Dan Fogler as Randy Daytona, and (a guy I had never heard of before) Thomas Lennon as his German nemesis . Daytona is gormless, ignorant and well meaning, while Karl Wolfschtagg is intense, corrupt and straight up evil, Lennon somehow steals the film in a bit role that sees him absent from proceedings for practically two thirds of the film. More chuckles are spread among the copious number of recognisable (yet often not enough to recall their name) character actors and comedians who populate almost every minor role in the film: Patton Oswalt, Terry Crewes, Aisha Tyler, Diedrich Bader and James Hong all mug for the camera and ham their way through their onscreen moments in an attempt to cadge whatever laughs they can in their brief moments, with Maggie Q playing the hard to fathom love interest to Fogler’s unattractive Daytona. The ending is suitably stupid and while 100% unnecessary and undeniably ludicrous Balls of Fury somehow manages to avoid the Scary Movie, Disaster/Epic/etc Movie comparisons by jagging a few actual jokes in among the pretty colours and ‘how zany is this’ childishness. Final Rating – 6.5 / 10. Shouldn’t work and kinda sorta doesn’t. Which means it kinda sorta does. Funny enough and totally forgettable.